1) Rename it as "leoimg.nbh" and put it your root of sdcard. Run (h)spl from your device with VolDown+Power and flash it. Note: These processes wont erase anything from your phone. But anyway, I recommend backing up your phone. Seems very austere to me. Here's the one I have been using for ages - similar. wow! can you share it with us? symbuzzer wrote: wow! can you share it with us? If you wish.. It is a small nbh to be flashed the traditional way. I don't think it can cause any damage but a good backup is always prudent! That is an old splashscreen, and, from what I can see, is also built into Tytung's JB ROM (logo.rle). FWIW, I spent at least 3-4 months reading at XDA before posting. MarkAtHome wrote: That is an old splashscreen, and, from what I can see, is also built into Tytung's JB ROM (logo.rle). Old? Yes. It was made by Jim McCabe who ported some of the Dinik Anastasia designs to Android. No idea if it is part of the ROMs. This is the same theme and person who did the skin for Go Contacts shown in my screenshots. NYLimited wrote: Old? Yes. It was made by Jim McCabe who ported some of the Dinik Anastasia designs to Android. No idea if it is part of the ROMs. An even more black-cLK-friendly splash screen that I occasionally use is attached below. As the logo used in cLK so this splash screen is based on spalm's wp boot-animation. PS:I'd suggest changing this thread to a collection of (dark) splash screens. Thanks, it is a good idea;) I will change i and will post a "how to crate splashscreen" procedure for this. Hi dear Leo users. I wrote a tutorial about creating splash screens. I hope, it will be useful for everyone. 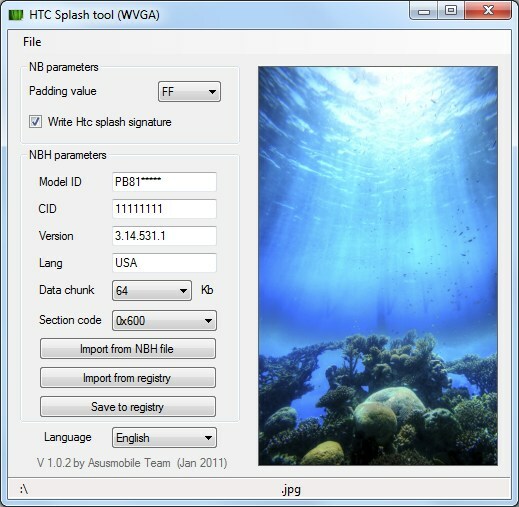 1) Download and run "HTCSplashTool.exe"
3) Select an 480x800 and 24 bit BMP image from "File > Open BMP"
4) Convert it to nbh file from"File > Convert to NBH"